Hobby update 31/7/17 - Progress rocketing along! Greetings all - it's that time again where I generously grant you a quick peek into my painting pile! 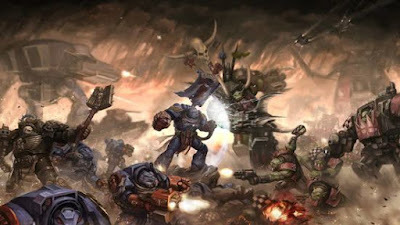 This week, with the advent of the new space marine codex and having finally settled onto a 2000pt standard list following extended unit testing I've been going back to the dusk knights to get that list up to scratch. More after the break! I've got a quick review of my game last night for you all now, looking at what happened, my list and how it worked as a whole, and any other thoughts I have on the game, mistakes we made etc. We played the Scouring, using the Hammer and Anvil deployment map - the photo below is from turn two before any of my units have moved. You can see the mob or ork boys on my right flank is considerably thinned out from its original starting size of 30 thanks to the liberal application of assault cannon fire (the dead pile is at the top right of the picture). There are also 3 killa kans awol thanks to the missile launcher devastators. I do think my opponent made a mistake with his choice of deployment map, if I were him I'd have wanted to start much closer with much shallower deployment zones. Honoured Sosimo lines up a few more Orks, the survivors of the first volley. Scout snipers survey the field - being able to place these guys in cover has been huge when I've used them so far, as their +2 thanks to the camo cloaks makes a big difference. The two Deff Dreads were a big threat in this game, though the one on the container has just killed the last surviving member of the first scout squad. The second was threatening my left flank, but the twin assault cannon razorback combined with the libby and a squad of vanguard veterans did enough damage to give it pause. The burna boyz in the trukk in the centre made mincemeat of my grav devastators, which hadn't been particularly effective in this game, but that's hardly surprising given the lack of 3+ or better saves in the Ork list. Thankfully, the contemptor came firmly to my rescue, trashing the trukk they were in and then mowing down the squad. Captain Iago and his jump pack vanguard veterans came in on my turn two once the majority of the orks had cleared their deployment zone. they shot out a few gretchin before heading for the two loota squads. Captain Iago looks for a moment like he's taking the easy option of slaughtering grots, but then changed hi mind at the last minute to charge the lootas on the gantry. He ploughed through them with ease, wiping the squad out thanks to the extra strength from his Relic Blade. The Vanguard Veterans then charged up the gantry structure, wiping out the unit of 4 lootas occupying its top floor. The aftermath - with a table almost completely clear of Orks, the Dusk Knights had pushed back the greenskin threat for now. So, looking back at the game, how did my army perform? Well first, I have to accept that whilst my dice rolling started out below par, it had definitely warmed up by my turn 3, when everything seemed to work and my opponent wasn't making anything. The missile devastators were, ahem, devastating! Turn 1 they flattened a unit of 3 killa kans, and they took out another two later, even the frag missiles I used for a turn were decent, though I rolled well below par for the number of shots. In contrast the grav devastators were pretty ineffectual. They stripped a solitary wound from the trukk before getting burned by its occupants. In hindsight, I should have used their S5 and high shot volume to take on the boyz units, I confess I hadn't originally realised the Orks had so little 3+ armour in their list. Inconclusive test for them really, I must remember next time to pick their target better. I took three squads of scouts to fill out the minimum troop requirements of the battalion detachment, giving them sniper rifles and camo cloaks so they could operate as character killers. They weren't hugely effective in this role, mainly due to my inability to roll many sixes to wound. There was a bright moment when they finished off the weirdboy and another when a pair of them shot the last deffkopta pilot from out of his machine (finally got those 6's!). Overall they're not likely to win the game, but for their points they're a solid choice and have a genuine role at least. Wow. I've taken these guys in three games now and they've been superb in all of them. On paper the Kheres Assault Cannon looks a little underwhelming, but it's been very effective for me every time and once they get into combat stuff they hit stays hit. And very flat. 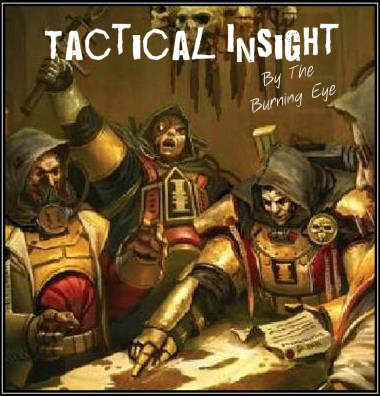 Their better ballistic ability means that even after moving they still hit stuff on 3's, so their fire is actually pretty reliable, and I notice there's a stratagem in the forthcoming codex that lets them grant re-rolls like a captain - pretty handy if you ask me! The flat 3 damage from their fists without any penalty to hit is also very nice - not unreasonably overpowered given what they are and that similar creatures/walkers get the same benefit, but very strong nonetheless. What a workhorse! I take twin assault cannons on mine, and though they only hit of 4's when moving, the volume of shots makes up for it. They were even more effective in this game as they completely ignored the Orks' armour, so every time I was shooting them at a squad, they were losing 4-5. I'm definitely going to get a second conversion kit from FW, and am seriously contemplating whether to add a third into the list. Again, a brilliant performance from the flyer - quantity of fire is just as important here as quality, because this fella can target just about anything and have a decent answer for it. It helped thin down a boyz blob on turn 1, then stripped Ghazhgkull down to a single wound on turn 2, before killing a deff dredd in my third turn. Again, my opponent had no answer to it and the only games it's been ineffectual was against the eldar when a wraithlord took it out with a very high damage roll from two bright lance hits. Crucial component of the list, he allows me the re-rolls that make the devastators so good. I still need to keep a careful eye on where he is because a couple of times I had units that wandered out of his aura effect, but when my devs got charged by a skorcha he was able to intervene heroically and pounded it to smithereens in a single turn. Didn't do a huge amount this game, and I would definitely prefer to have him with a jump pack (you're right about that Steve), but he put a couple of mortal wounds on a deff dredd with smite - I just forgot to do anything else with him to be honest. Needs more table time certainly. Proved what he can do certainly - he butchered a backfield squad of lootas before they had the chance to return fire. Probably not the sternest test of him, but this is the role I picked him for - dropping in a little later once the eney deployment zone is a little clearer and running riot (or forcing my opponent to hang back with someone to counter him). Really pleased with their performance this time round, ok the jump pack unit got to pick on the other lootas, which was exactly the sort of target they needed, but they were very effective. The squad without packs also did a decent shift, taking quite a few wounds off the deff dredd all things considered. In the future I think I'll probably look at consolidating them into one larger unit with jump packs and possibly adding in some power fists/thunder hammers and maybe a storm shield or two, but at the moment I've only got 5 built with packs. As for the game, well as I said earlier, I think the hammer and anvil deployment was a real mistake. It allowed me to deploy deep making the most of my firepower and actually giving my opponent more ground to actually cover. When we discussed it afterwards and I think front line assault would have been far more effective for him, as I would have been forced to spread my army to the corners to keep my distance, at which point he could have picked on one part at a time. Dice were definitely in my favour in this game, though to be honest I don't think it was that which won the match for me. I've tested the units in the book extensively now and I'm pretty happy I picked a balanced list, with my only real tweak after this game perhaps being to look at another razorback and bulking out the vanguard. Perhaps when the codex drops I might find more of a use for tactical squads, we'll see. The balance of fire in my army seemed almost perfect for my opponent's list too, the Stormhawk and missile devs gave me some decent shooting against the mechanised elements of the enemy, but crucially I also retained the option for volume fire. Assault cannons have always been one of my favourite weapons and nothing has changed there, there's a reason the list can put out 48 shots per turn from that weapon type! As ever, if you have any comments or ideas as to how I could tweak things, please let me know! Hobby update - 24/7/17 - finishing some projects off! Greetings all - it's a personality flaw I guess, but being a hobby butterfly to the extent that I am often means that I don't get to finish units off as much as I would like to - I get distracted by the new shiny instead and a unit will sit in my painting box 75%+ finished but no longer getting any attention. So, last week, I decided to get a grip on myself (no, not like that) and knuckle down to finish some of the units I have lying around half-painted. I'm pleased to say that the stern talking I gave myself was a success, though I did have to go and sit in my room and sulk for a bit at first. So, without further ado, here are a few things I've managed to get to completion (or in one case, completion except for basing because I've got more to do and I want them to be consistent). So, starting with some commission stuff - a squad of Plague bearers (strictly speaking not quite finished, the heads carried by the champion need finishing off, and this is the squad whose bases will wait for the rest of the commission. I had great fun with this squad, trying a few things I've not done before, like the Nihilakh Oxide on the bronze details, and I also picked up some Nurgle's Rot to use on the open wounds - it doesn't show up in the photos but that stuff is great to use! Then I went back to work on the Swords of Dawn stuff I showed off last week. First up was the Librarian. This guy also was great fun to do, and actually he got painted far quicker than any mini I've done for a while because it's such a nice figure to work on - I've heard others have had trouble assembling this model, but to be honest I had no problems with mine at all - a little fiddly perhaps, but nothing compared to some of the models I've built! And finally (and it really does feel like FINALLY) I got the Hellblasters finished too - I may have just been dong little bits here and there, but this squad really does feel like I've spent a lifetime slogging away at it. Shame really because the models are nice and the painting wasn't complicated by any measure. Building and getting started on the next part of the commission (Bloodcrushers) and cracking on with my Dusk Knights standard list - there's a couple of units that I'm now going to be using with the Dusk Knights farm more regularly so they just became quite a high priority for me to get painted. In particular this is the missile launcher devastators and my second contemptor. Also, expect to see a bit more scenery as I look to try and get some more cargo containers done for the Grim Dark Brotherhood. Morning all - having finally finished testing units from the space marine index, I sat down last night to start building my first 'standard' 2000pt list, so here we go! 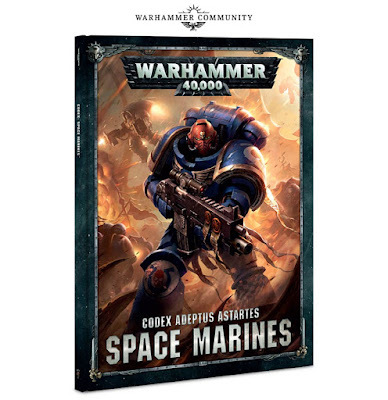 Greetings all - well I can happily say that I've now finally finished testing out all the units etc that I want to for my space marine collection in 8th edition, so I figured I'd post up a little mini-review of my thoughts and findings - hope you find it useful and it's not invalidated by the new codex too quickly! Chapter Tactics revealed - my initial thoughts on what we now know. 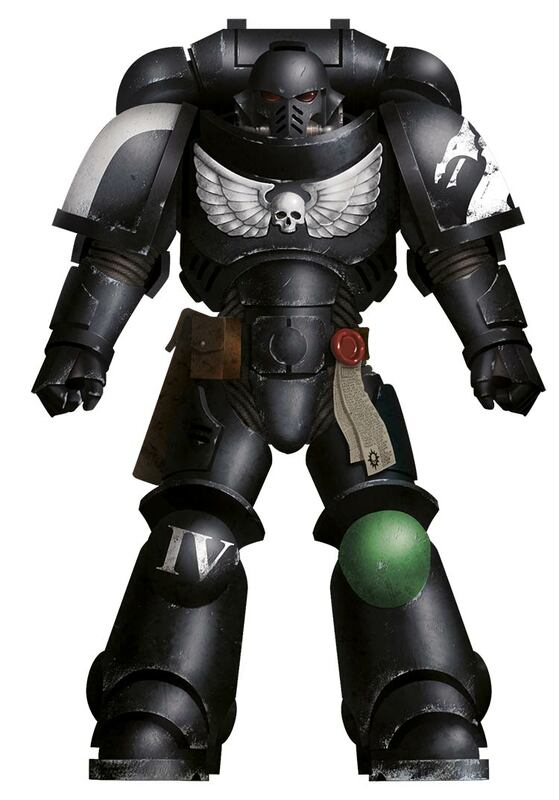 Greetings all - time for me to have a quick look at the chapter tactics stuff we saw revealed last night I think! See more after the break - I think some of the conclusions and the implications of the tactics may be quite interesting! 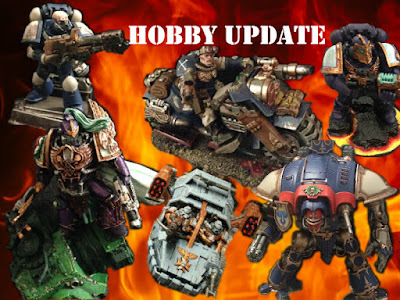 Hobby update 17-7-17 - Gravis Captain done, lots more in the painting queue! Greetings all, welcome to the little window into my hobby life! This week I've still managed to get progress on a few different things, but lots more to come - enjoy! First up, I finally managed to get my Gravis Captain finished. This has felt like it's taken ages to do though in real terms I've probably just done lots of little bits on him rather than sitting down and really knocking out a good long session. To celebrate, I made a little video of the pictures I've got from it that you can see here. I really enjoyed this, so will probably do something similar for my next feature models, though in those cases I'll make sure I take more regimented stage pictures. Speaking of next feature models - say hello to my Primaris Librarian, Hossan Kadjar. This is a truly gorgeous model, and contrary to the little paint sessions I put in on the Captain, I've already put in a couple of longer sessions to get him nearly up to scratch. In a departure from my normal method (paint whatever bit you fancy and hang the consequences) I decided to structure this paint job a bit better, so I painted all the base colours onto him first. As a result, the photos below don't make the most of the contrasts that I'll be getting onto the final model, but they give you a good idea of the process that I generally go through (in theory at least, in practice I often do upper layers before some of the base colours cos I'm impatient). Another squad that feels like it's taking me ages is the primaris Hellblasters. They're getting there, though I won't deny there's still plenty of work to do on them before they're finished. Hopefully I'll get some more time on them tonight. Not hobby work as such, but I played a very successful game this week where Sire Gabriel came out of the cupboard for the first time in a long time. Yeah, he's still good. This was a weird game though, as some of you may realise when you see the army I'm facing - yes, it's my old Iron Fists bike list on the other side of the table! Weird! I'm still plugging away at commission stuff too, here's the plaguebearer squad I'm working on at the moment. These are actually lots of fun to paint! Scenery - you all saw my first efforts at the WD paint scheme I'm following on my landing pad last week, well here's the next step. I didn't spend too long on it to be honest, but I wanted to start filling in the green to make sure I was happy with it. Long story short? I am. welcome to my 5th game of 8th edition 40k - this one was a 2000pt game of Dusk Knights Space Marines vs Night Lords, using matched play rules. Bear with me on the photos - both armies wear Dark Blue armour! Hobby update 10-7-17 - Setting the scene. 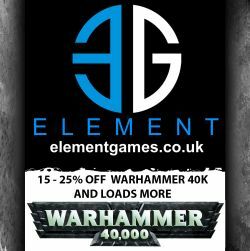 Greetings fellow wargamers, welcome to my hobby cave once more, let me shed some light on the projects that I'm working on at present so you can all be inspired and shower me with praise (joke). Greetings all - today I just wanted to have a quick chat about that paragon of all things red-fisted - Pedro Kantor. I've long loved this miniature and have used him a few times in my first games of 8th edition, whilst I realise it'll probably be invalidated in less than a month, I figured I'd put down my thoughts on his performance in those games and how to get the best out of him in your own. 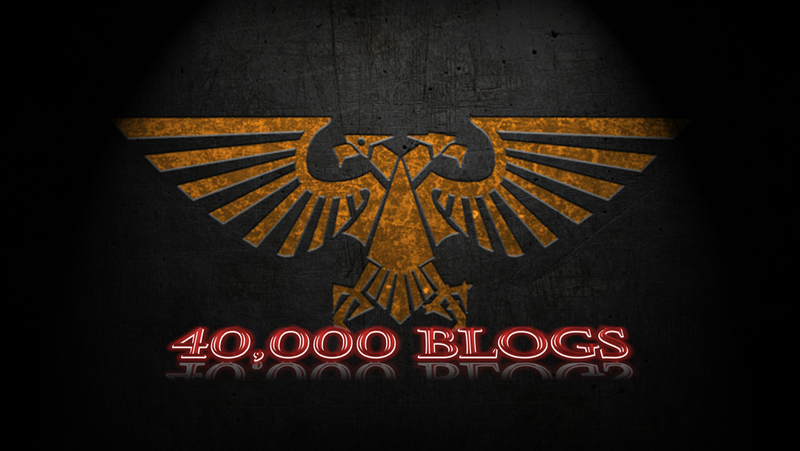 Wow, so 'New GW' continue with the 'full disclosure' method of interaction with the community! I for one continue to be both surprised and delighted by them - let's have a look at what's been said shall we? Greetings all! I know things have been pretty quiet on the blog front recently - let's blame having been away on holiday then having a lot of work to catch up on when I returned shall we? It probably also doesn't help that I'm working hard on getting some scenery painted up and trying to get my head round 8th edition as well. That's what I wanted to talk about today however, my first impressions of the new edition after a few games. Greetings all! Welcome into the depths of my hobby desk once more. This week I've mainly been working on my marine models - getting a few bits up to scratch to get them on the table.